'Sleep Less'... If there is one person who knows about lack of sleep it would have to be Jesse Rose. Take the month of March 2010, Jesse went from Berlin to Tokyo to play at Womb, back to Berlin for a day in the studio before heading off to Paris for his Made to Play residency at La Regime, then direct to London to sign a new act, back to berlin for ten hours and it was off to L.A and the start of his U.S Tour, which ended in three gigs at WMC (Made to Play vs Rekids & Get Physical Beach party being the highlights), before jetting off to Mexico to play an extended set at Santanera in Play Del Carmen and then an afters on the beach before jetting back to Berlin to finish a remix for Sound Pellegrino. Feel tired just reading this? Then try actually doing it! For Jesse this fast paced life is nothing new, after growing up in a city that never sleeps, he's continued to strive touring the world for many years, producing genre defining productions, remixes and running two top notch labels; Made to Play & Front Room, now in their fifth & tenth year respectively, it would be fair to say Jesse is on top of his game. 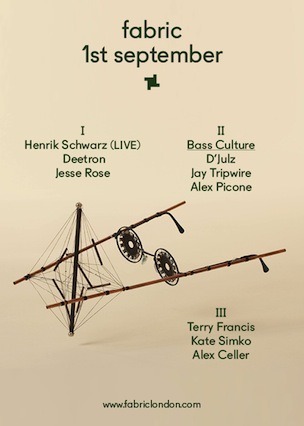 fabric this weekend with mr henrik schwarz! an oldie but a goodie…. been finishing my sets with this lately..
MY NEW SINGLE ‘FATMAN’ IS OUT NOW! MY NEW SINGLE 'FATMAN' IS OUT NOW! my first solo single of 2012! IT’S ALL ABOUT SUMMER FUN….